a defining capability or advantage that distinguishes from competitors. If you missed it, the world is flat, thanks to the fall of the Berlin wall, the rise of internet, the Y2K debacle which we outsourced the fix to India, among other things. Read The World Is Flat. Businesses core competencies distinguish it from its competitors. That little business you have going on called, You, Inc., it now must embrace its own core competencies. You are selling, but who is buying? If you never have a problem finding a job, there is a good chance you are an “untouchable.” Which is a good goal. 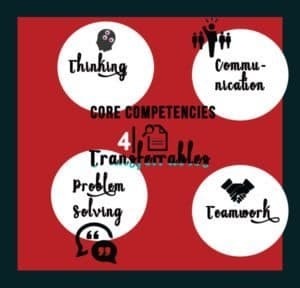 Maybe you got there by being special, specialized, localized, or anchored, but certainly, you have transferable core competencies. So who is buying You, Inc.? The answer to that question, defines the core competencies you will aim to acquire. These core competencies will get you into interviews, an entry-level position, and keep you hired, for a couple years. A couple of years? America’s middle-class jobs are changing. If you do not plan to use an entry-level position as a springboard into greater responsibility, you might as well sell Polaroid film, because that job will likely be on the cusp of automation, digitization, or outsourcing. Yay, someone is buying! You’re hired! Once inside the first door, become “special or specialized” continuously learn more about your job and the jobs vertical to yours. Business is hard pressed to outsource, digitize, or automate the responsibilities of its “A” players. Be “localized or anchored.” Note: being rooted in a community can buffer you against foreign competitors. How will the global economy outsource, digitize, or automate a masseuse? It can’t, planet Earth is not the Sixth Element, yet. However, nothing is safe. Before the fiber optic highway connected the US to unconnected parts of the world, kids in developing countries had little hope of using their skills to compete in the US marketplace. Now we can outsource to anywhere on the planet, product or service, assuming connectivity. Competition 3.0 is here. Ten years ago, some of the brightest kids in my college classes were foreigners. Many of the dumbest and laziest? Americans! If you find your way into an entry-level position. Learn from those around you. Be a sponge, a life-long learner and grow into positions that require more expertise. Do not settle into jobs that are on the cusp of outsourcing, digitization, or automation. Stay hungry; do not get complacent. At You, Inc., always be improving and adding to your core competencies. What’s gained other than Competitive Competencies? Continuous development of your core competencies does not ensure that your inevitable downsizing is less like sand slipping through fingers, but it will give you confidence and additional competence, which are transferable. I once had a job where every few months my boss would enter my office and say, “remind me why we need you?” This boss loved me and battled for my position more than I can know. Why was I so naïve to think that being great at what I did would create loyalty among the owners? Loyalty is a relic. The only loyalty an owner will ever show you in a global economy is to give you a chance to take on the responsibility of two or more people. If loyalty is what you seek, continually manage more for less and you will always have it. This is the new race. Be mentally nimble and vigilant and run faster, harder, smarter than the competition. The new name of the game, increase your competencies and travel beyond the first door, out of reach of outsourcing, digitization, and automation. You might even aim to be “untouchable,” extremely employable no matter the vertical. When you venture beyond the competencies required at the first door, newly acquired competencies are transferable and linkable. When the mission is lofty, 20% of the road is behind and 80% is in front. Set high standards for yourself and never be satisfied with the status quo.